To up the challenge this week, I have a panel with a blank caption that is NOT, in fact, completely blank. How crazy is that?! What is the mysterious cloud of green funk? What is the identity of the portly fellow, and what is he doing? 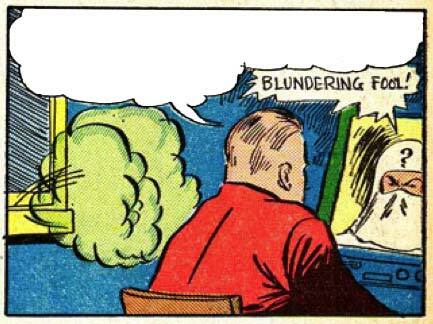 That's up to you to decide, but somehow whatever you write to fill in that missing dialog balloon has to make sense with the white-clad fellow's "Blundering Fool!" rejoinder. Keep it clean, appropriate for a PG-13 type of audience. That's it! I'll choose a winner next Tuesday, to be selected by whichever one makes me laugh the most. So get ready to bring the funny! The winner will get to choose to have either a caricature of their face, or any one item of their choice, included with the HeroMachine 3 final version. 1. I shouldn’t have eaten all those beans and eggs last night. There’s no ventilation in here! Hmmm. I was going to make a gas joke, but that’s going to be a popular choice, so I’ll have to get back to you on this one. 1. Yeah, I let my cousin George install the vent system in the lair. He charged half-price, too! 2. So I told that the scientists all those safety mechanisms and controls are just wasting our budget. I mean, what could POSSIBLY go wrong? 3. Oh no! SuperFart has penetrated the lair! We’re doomed! I was wondering what were the original captions? 3.) So Mister Genie, you’ll grant me any 3 wishes? Ok, I wish for a Big Mack, Fries, and a Coke! 1. No worries sir he’s my new sidekick, Gassy. 2. Master have you heard that song about beans. 3. Look at this master. I cleaned your sculpture of green eggs and ham so delicately so that it’s really clean look at it…whoops…Please don’t kill me. 1) Yeah, I hired the intern McFarterson, he has the office next to mine. Why? It’s safe, Doctor Why. There’s no way that the Green Fog could find me here. 2) So the lawyers said that if we called our Giant Green Popcorn “lighter than air,” it HAD to be lighter than air. Why? If it weren’t for those damn white house tacos George likes so much throwing my aim off, I would have actually killed him. 1. was i supposed to let this gass out? 2. I farted and killed your wife. Im rally sorry. Gas cloud near my head? Only a blundering fool would miss that. 2) I told Mr. Bay not to show the robot scrotum, but he just kept insisting upon it while giggling like a little school girl. 1) Yeah, I’ve started smoking new cigarettes. For some reason they set alight in my pockets and I’m getting more headaches now. 2) I dunno, I just thought scribbling on my window might help? 3) And then he got me monologing, and to put it shortly…the sharks with frickin’ lazers on their heads didn’t kill him, he escaped, and he now knows the location of the doomsday device and how to destroy it. What makes you think I ate the kryptonite laced bean dip meant for Superman? 1) Master! It’s Howard Stern! He found our headquarters and the automated guns can’t stop him! 2) Uh, sir? Just out of idle curiosity, you understand, I was wondering what you keep in canister number 8? You know, in the biolab? 1.did some one pass gas! Please strike that “Why?” from my 2). Mm, I guess beans on toast and soda was not such a good combination with the power syrum… I’ll have to rethink my stratigies if we want a powerful hero not a farting zero. Well, that’s what you get for employing me as your boss in your nuclear power plant. You get idiocy, explosions… and by the looks of it, human methane production. Okay then I just gave my winning lottery ticket and my credit cards to my new wife, so she can go and buy me something nice like she said. What amazing luck that I found her right when I became wealthy. I’m a lucky guy. Skunkman has gotten wind of our plans. Nothing to worry about, boss. The Phantom Broccoli HATES the colour red! I know I shouldn’t have taken the money without asking, but the return’s gonna be great. The guy’s like royalty in Nigeria, he’s not gonna screw me over. 1. I bought the “Miracle Cloud” on Ebay. It’s guaranteed to make me rich and thin! 2. If you look at the green cloud real close, you can see the face of Jesus! HALLELULAH! 3. Not to worry, sir. Fox News said the reports of green body-possessing gaseous aliens are a rumor perpetrated by the liberal media. @TheNate: Thundering mole, goal shaol, pole. There’s no point to this, I just wanted so list some of the possibilities. Mr. Bin Ladin sir, I’m sorry! I accidentally set the gas bomb off in your bedroom! Is the guy in the hood a confused clansman? Is he not sure who he hates? Did the guy with the Elmer Fudd coiffure accidentally bleach Cobra Commander’s (TM) uniform? 2. I couldn’t help myself, pulling the football away was bad enough … but for getting Linus to spike my coffee with Ex-Lax (TM) … she deserved to die. 3. I’m sorry sir, but I have this strange feeling that those weren’t the droids we were looking for. (Again with an enigmatic green expulsion). 3) Um, was I insured for that gas canister? Did I get the full asking price on your “Mass Metaphysical Crisis Ray”? Oh, way better than that, Punctuation-Man! I traded it for a bunch of magic beans! I know, I know, awsome deal, right? I’ve been eating them all day so I think it’s only a matter of time before I crap out that giant beanstock! I want something like hero machine that i can use for free and help companys like Ugo come up with ideas for a comic or something. 1. …make a costume out of this flying green goo and you’ve got yourself a sidekick, Confused Ninja. But I still need a name. Thoughts? 2. …the Holographic Shrub! It’ll be bigger than Pokemon and I got us in on the ground floor! 3. Duuuude it totally says “badass” in Japanese. It just LOOKS like a question mark in English.